Ever since my childhood, I have been fascinated by jewellery and as time passed, that fascination has transformed into a love and passion for all kinds of gems and jewels. One of my favourite gemstones of all is ruby. I am sure there are a lot of people who will agree that a ruby has a class of its own. 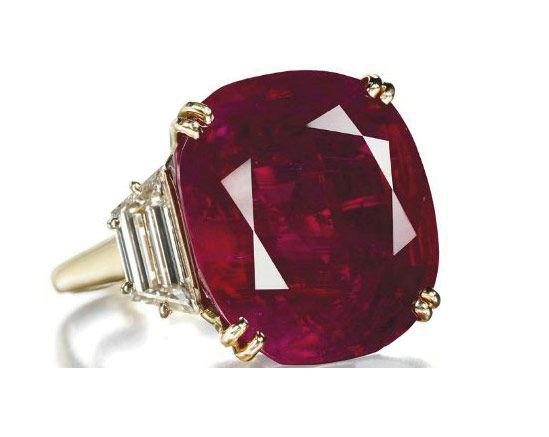 The word ‘ruby’ has been derived from a Latin word that stands for red. It is the hardest known stone after diamond (a diamond’s hardness is 10 whereas ruby’s is 9 on the Mohs scale which is an instrument that measures the hardness of the stone). And although we think of diamonds as the most expensive gemstone, rubies and other gemstones also come with an expensive price tag. The National Museum of History in Washington D.C. has the largest and finest collection of rubies in the world, most of which are from Burma (currently Myanmar). Burmese rubies, most of which are found in the Mogok (Mandalay) and Mong-hsu regions, are famous for their distinct colour. Rubies are also found in various parts of the world including Thailand, Vietnam, Sri Lanka, India (Kashmir region), and parts of the African and American sub continents. In 2007, new mines were discovered in Montepuez, Mozambique and by 2011 75% of those mines were bought over by a London based company called Gemfield. There are four aspects to a ruby, namely, cut, clarity, colour, and carat. There are two cuts that are most popular in rubies—oval and cushion cuts, wherein there is marginally less wastage of the stone while cutting. Other cuts that are more popular with bigger stones are the princess, heart, pear, asscher, emerald, and round brilliant. The clarity of the stone looks into all the aspects like size, colour, location found, and quality of all imperfections. 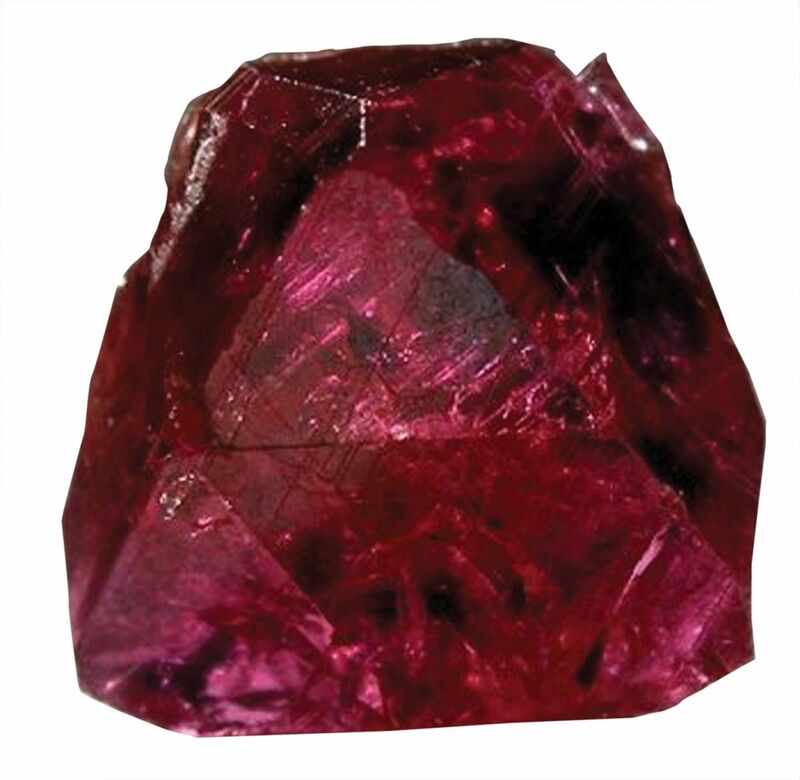 A ruby, just like a diamond, also has inclusions, but these inclusions are thin lines called needles. These needles can be short, long or slender, and sometimes they look like a thumb impression. Rubies with a few inclusions are very rare to find and can cost millions of dollars per carat. These needles help us differentiate between a real ruby and an imitation. 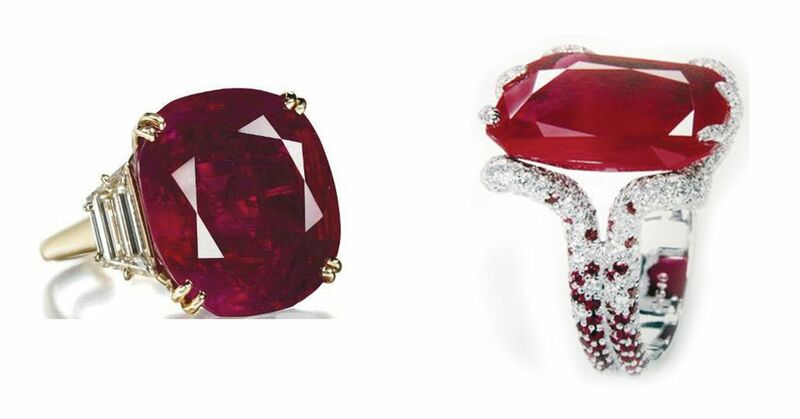 The colour of the ruby is very significant in determining the price per carat. The best colour is blood red, also known as pigeon red—because of the colour is the same as the first two drops of blood of a freshly killed pigeon. 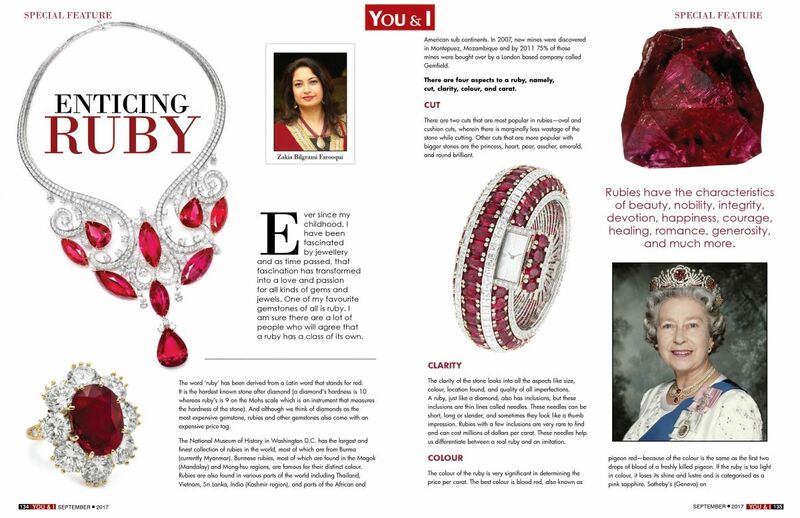 If the ruby is too light in colour, it loses its shine and lustre and is categorised as a pink sapphire. Sotheby’s (Geneva) on June 29th, 2011 sold a cushion shaped Graff Ruby weighing 8.62 carat for a price of 1 million dollars per carat. The ruby had a distinct colour (pigeon red) and was found in the Mogok region of Myanmar. Rubies have the characteristics of beauty, nobility, integrity, devotion, happiness, courage, healing, romance, generosity, and much more. The word ‘carat’ comes from the Greek word ‘kerateeon’, which means fruit of Carob, the seeds of which were used in the past to measure gold and gemstones. Today, a carat is exactly 0.2 gm (approximate weight of a small paper clip). Every stone has a different carat weight. 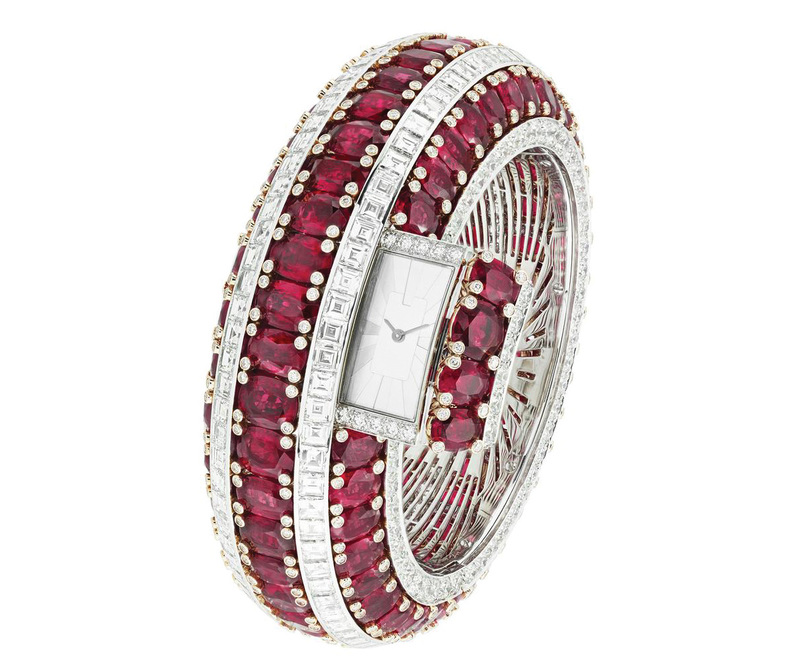 Sotheby’s sold one of the most expensive ruby called Sunrise Ruby on May 12th, 2015 in Geneva. The size of the ruby was 25.59 carat and it sold for $1.2 million per carat. This ruby too came from the Mogok region and it was set by Cartier. The reason it sold for such a hefty price was its extraordinary size and colour. There are many grading systems used to assess the quality of a ruby and used as a guide while buying rubies, but certain basic rules can assist us during our purchase. Natural rubies which have a pigeon red colour and have very very small (VVS) inclusions (that can only be seen by an experiences eye under a 10x magnification loop) are categorised as VVS and are the most expensive and rare rubies. Natural rubies which have a medium-dark colour and have very small inclusions are categorised as VS. The inclusions in these rubies are not visible to the naked eye but can be seen under a 10x magnification loop. Natural rubies that are light to medium in colour with small inclusions are categorised as SI and ones with many inclusions are categorised as I, both of which are visible to the naked eye. 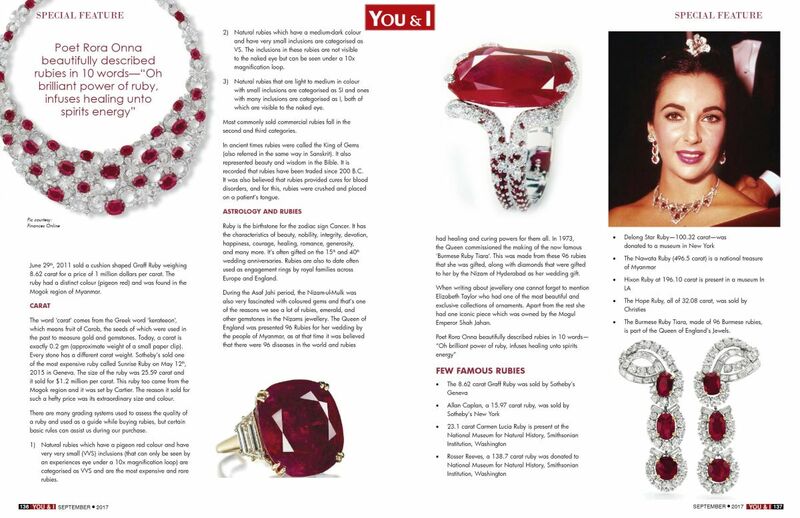 Most commonly sold commercial rubies fall in the second and third categories. In ancient times rubies were called the King of Gems (also referred in the same way in Sanskrit). It also represented beauty and wisdom in the Bible. It is recorded that rubies have been traded since 200 B.C. It was also believed that rubies provided cures for blood disorders, and for this, rubies were crushed and placed on a patient’s tongue. Ruby is the birthstone for the zodiac sign Cancer. It has the characteristics of beauty, nobility, integrity, devotion, happiness, courage, healing, romance, generosity, and many more. It’s often gifted on the 15th and 40th wedding anniversaries. Rubies are also to date often used as engagement rings by royal families across Europe and England. During the Asaf Jahi period, the Nizam-ul-Mulk was also very fascinated with coloured gems and that’s one of the reasons we see a lot of rubies, emerald, and other gemstones in the Nizams jewellery. The Queen of England was presented 96 Rubies for her wedding by the people of Myanmar, as at that time it was believed that there were 96 diseases in the world and rubies had healing and curing powers for them all. In 1973, the Queen commissioned the making of the now famous ‘Burmese Ruby Tiara’. 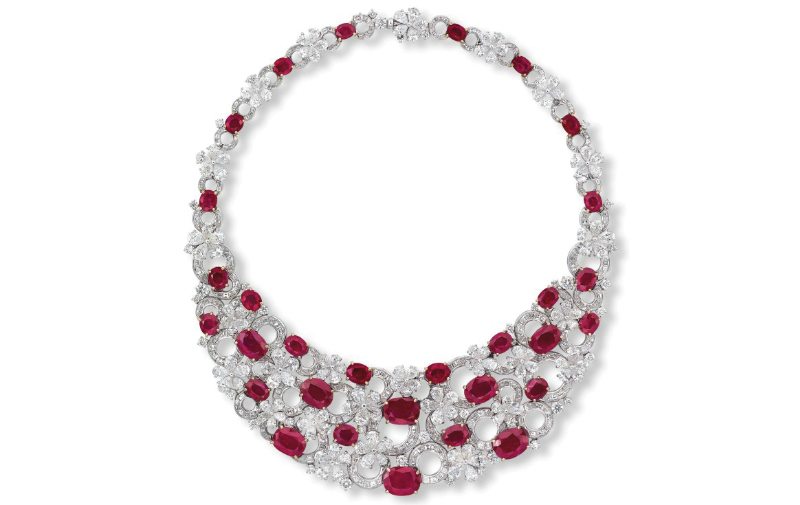 This was made from these 96 rubies that she was gifted, along with diamonds that were gifted to her by the Nizam of Hyderabad as her wedding gift. 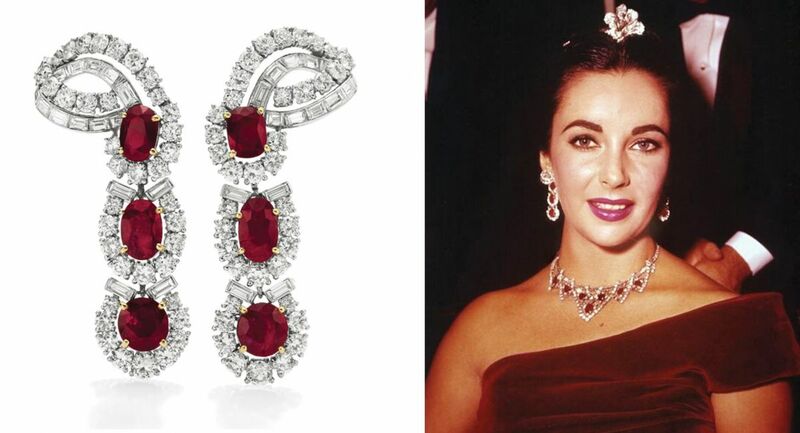 When writing about jewellery one cannot forget to mention Elizabeth Taylor who had one of the most beautiful and exclusive collections of ornaments. Apart from the rest she had one iconic piece which was owned by the Mogul Emperor Shah Jahan. The Burmese Ruby Tiara, made of 96 Burmese rubies, is part of the Queen of England’s Jewels.